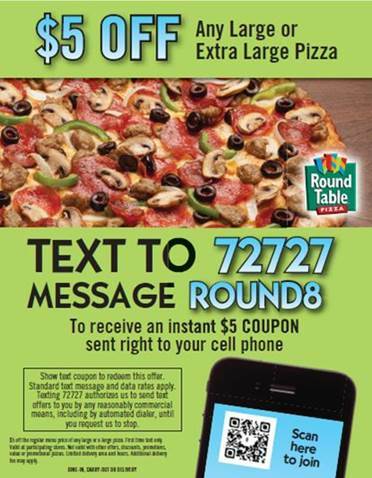 Round Table Pizza - Mobile Coupons | Mobile Marketing as it should be, easy and available. Round Table Pizza boasting hundreds of locations across the western United States contracted with AvidMobile in 2009 and have been building databases and sending SMS mobile coupons to their opt-in subscribers ever since. Their programs have consisted of two main components. Utilizing Point-of-Sale techniques such as table talkers, window clings, and Pizza box toppers that offer a mobile coupon and ask them to receive the coupon right to their phone to text in to the short code. This type of SMS Loyalty program has done extremely well for them over the years allowing them to build databases exceeding 4,000 subscribers per location they have. Each subscriber goes into a different database so that they can send store specific or region specific offers. The SMS loyalty campaigns they have run have always produced tremendous Return-on-investment for them. Round Table has often boasted 3-5% response rates on the mobile coupons they send out to their databases. Since they market to databases in the hundreds of thousands the return of additional transactions is significant. Lead Generation techniques were implemented long ago by adding Mobile call-to-action into their broadcast media buys they made in each market. From radio spots, outdoor displays, and mailers all of their media carried with them a central engagement asking people to text in to the short code if they wanted an awesome coupon. This allowed for people to see or hear the media and engage with their mobile phone to the short code and capture those subscribers into databases. By marketing to those databases afterwards allowed for a tremendous remarketing strategy that resulted in catapulting the success of their media buys and translating into new customers. The final advantage to these tactics are that they can also track the effectiveness of each marketing campaign they deploy by utilizing a different keyword and mobile coupon code with each campaign. Thus tracking opt-ins and redemptions and then the corresponding ROI of each media buy.